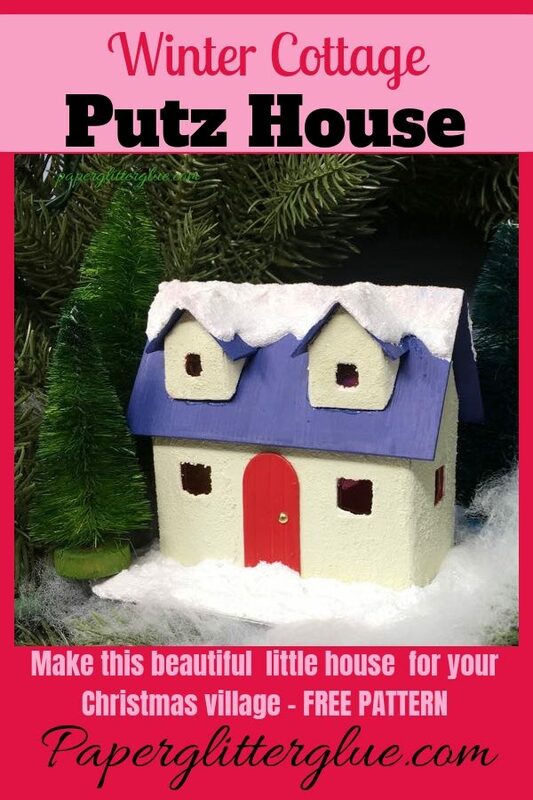 Make this cute little Winter Cottage with its red door and snowy roofline for your Christmas village. 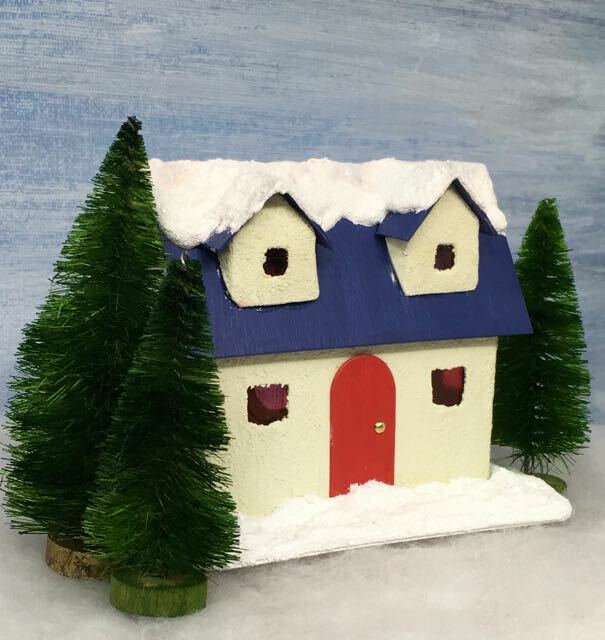 This little Winter Cottage has two snow-covered dormers on the roof to make it stand out in your Christmas Village. You can find the printable pattern in my Paper Glitter Glue library. 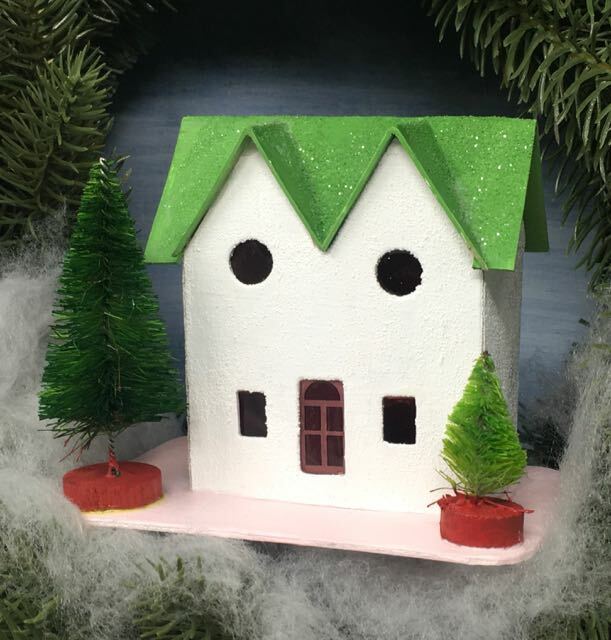 We’re almost finished with the 12 Houses for Christmas series. One more Christmas house tomorrow. 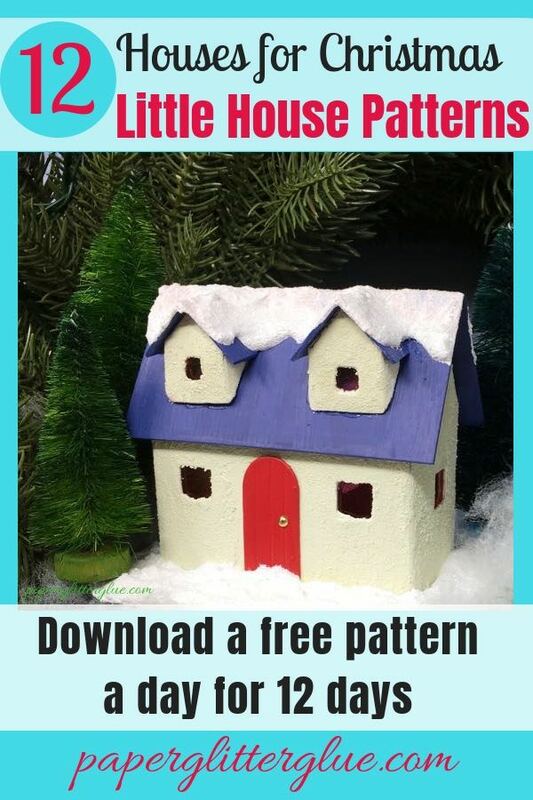 To make this house just follow the instructions for the previous little Christmas houses. The most unique feature about this house is the two dormers on the roof. I haven’t done dormers in this series of little houses. In fact, I don’t do dormers very much at all. One of my most popular houses has dormers though – the Sea Worn Beach House. That reminded me that I need to add dormers to more houses. They were very popular on a lot of vintage Putz houses as well. 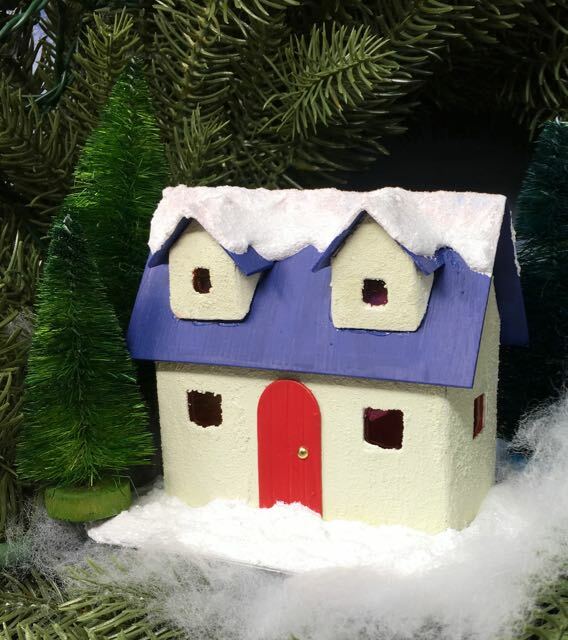 See the first two houses on the 2002 Houses of the Month at the Cardboard Christmas’ Papa Ted’s Place. But I also remembered that they are a little hard to do. This type of dormer is called a doghouse dormer for obvious reasons. Because the Sea Worn Beach house has a metal roof, the dormers kept sliding down and were hard to get them to stick. 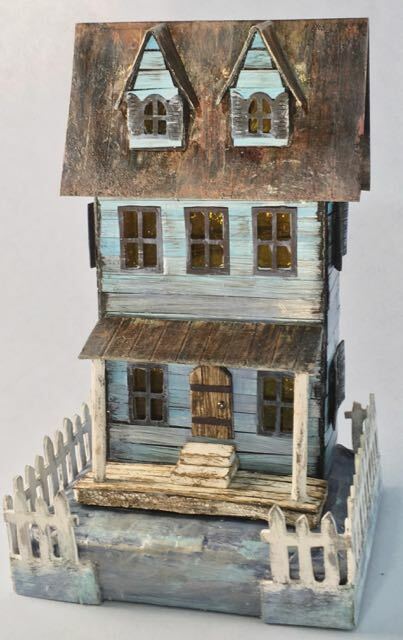 But it’s not nearly as difficult on the Winter Cottage Putz house because the surface is paint, not metal tape. The hard part on these dormers is scoring and folding the small pieces and then gluing them together. There is only one PDF pattern for this house because I keep messing up the SVG files. I promise I am trying to get them right. Eventually I will update every pattern in the library with SVGs files, but it is going to take me awhile. You will find the most recent items first in the Paper Glitter Glue library because they are in chronological order. Because this is a VERY simple house to make except for the dormers I’m not going over the instructions specifically except to talk about making the dormers. Generally, I recommend that you make your score lines on your patterns before you cut them out. On small pieces like these dormers, it is especially important because it is hard to hold them otherwise. And I’d like you to print a pattern out and work on the dormer first. See how it folds before you make the real thing. The dormer roofline is made just like we make the roofline on most of the houses with roof flaps and roof tabs – only on a much smaller scale. 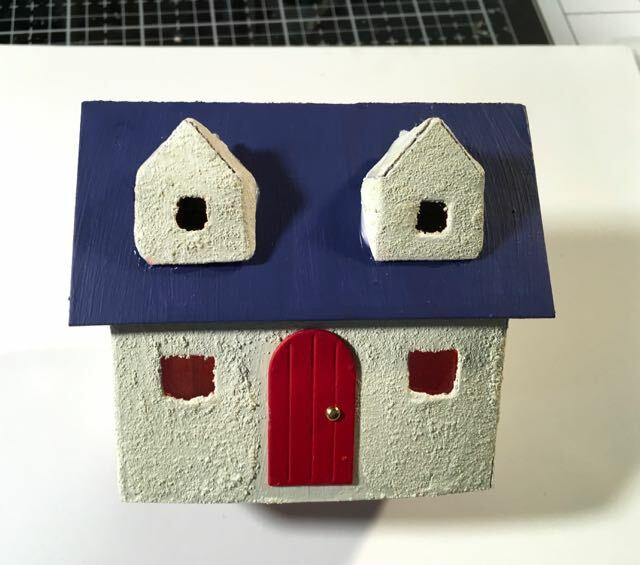 After you have played with the pattern a bit, then make your two doghouse dormers. Then glue the roof tabs down on the roof flaps so you’ve made a doghouse with an angled back. To get the tabs and flaps to stick I did use a little binder clip on each side. Make sure the dormer walls are square (well, try to anyway. Mine aren’t really square, but they are close) and let it dry before you attempt to glue it on your house. Once it is dry, then glue to the roof where you would like it. Then glue the dormer roof on. Another helpful thing to do here is to use thick glue like the Aleene’s Fast Grab because it will hold much faster. It’s hard to tape these little tiny pieces in place, so I just held them until they would stick in place. If you find this dormer stuff too frustrating, then it’s easier to make a little house like this with twin gables in the front. The effect is very similar. Also, I should note that unless you cut a hole in the roof, no light gets to the windows in the dormers. Because I am way behind on my little house making post for the day, I skipped that step. So in the end I think the dormers are worth it even if they are tiny and fiddly. I think they add a lot to the appeal of the little Putz house. What do you think? Last house in the 12 Houses for Christmas series tomorrow. I hope you will join me for that one. Then onto more Christmas projects – so many ideas and so little time. Be sure to pin to your favorite Christmas Pinterest board. 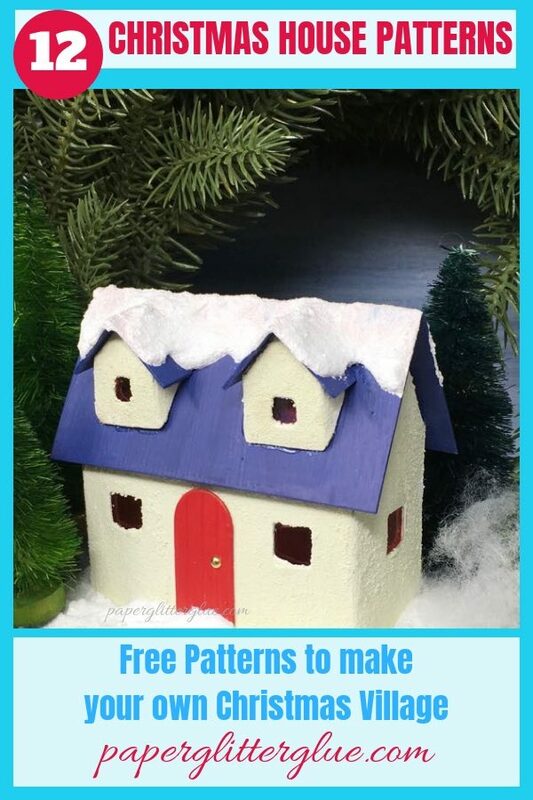 So you can start your own Christmas village and remember where you found the patterns.